So last time I was wondering why buckles might be a bit smaller than we might expect. I proposed that some of the reasons could include cost, difficulty of construction, fashion, and functionality. Looking at cost first – metal was expensive and valuable. Metal was dug out of ore deposits by hand and the smelting and processing of all metals was extremely labor and fuel intensive. Metals that were not available locally had to be imported, adding to the cost. Even the least expensive tin trinkets were cast in such a way as to minimize the use of metal while maximizing the effect. They were made as thin as possible while still allowing them to be functional. I never really appreciated how much the frugal use of metal affected the manufacturing techniques used for dress accessories until I began making them myself and purchasing actual artifacts. 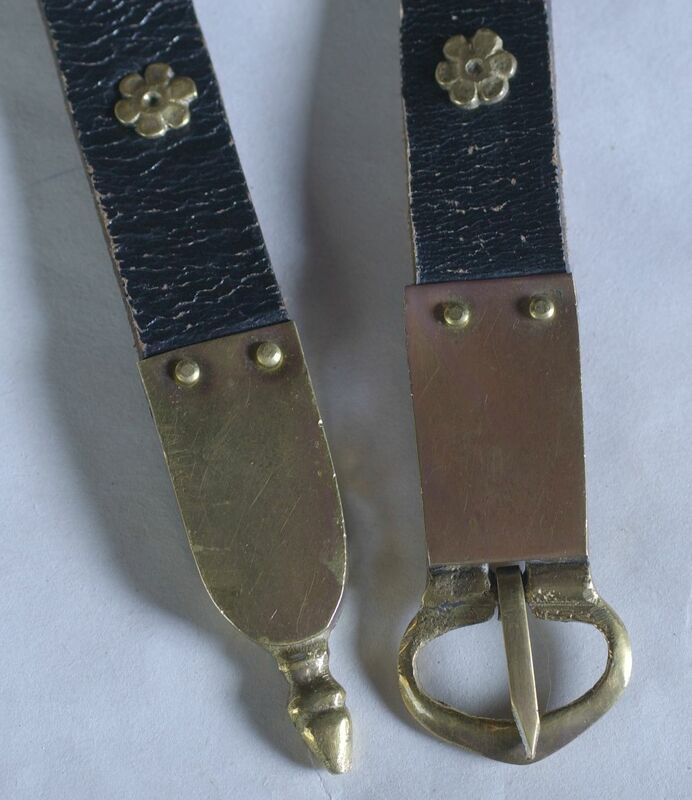 An excellent example are these buckles and belt ends. They are on two belts that my husband and I purchased at the Pennsic War about 18 years ago. We were looking for narrow belts with some pretty mounts, a buckle, and a belt end. I had seen lots of portraits with narrow belts and a few actual belt ends in museums, and these belts looked pretty good and seemed functional enough. And to be honest, they have worked perfectly well for all these years, and will probably make it for at least another five or six years. But now that I know what the real belt fitting look like it is very interesting to see the construction techniques. First we have my belt buckle, belt end, and mounts. 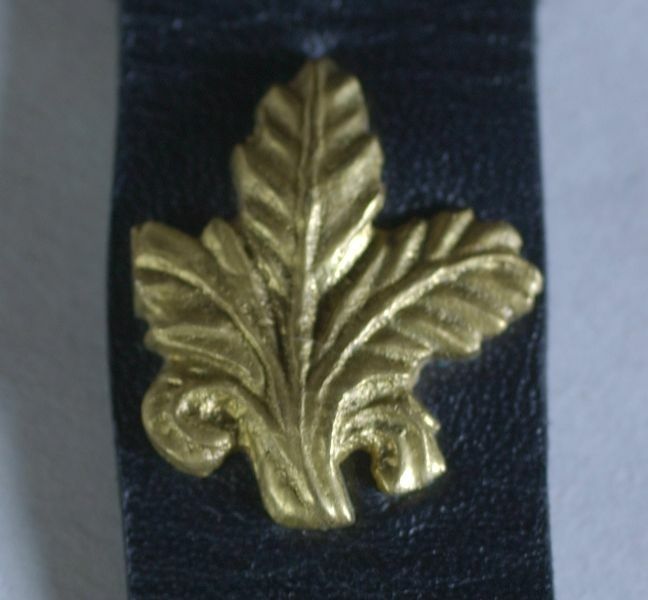 The leather of the belt is 3/4 of an inch wide, a respectable width. The mounts are of an appropriate size, and while the buckle and the belt end are fairly large, they are believable. If we look at the pieces from the side we can understand the actual construction techniques that were used. 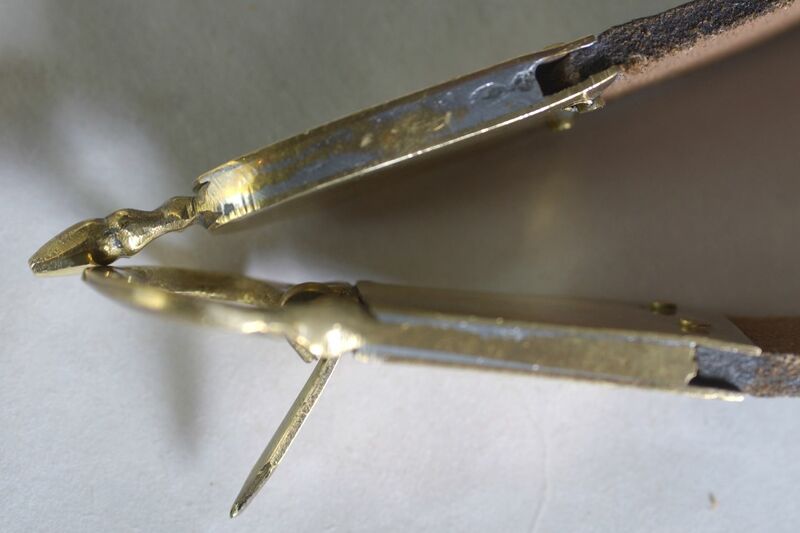 This picture shows graphically what it looks like when your solder does not match the color of the main pieces of metal. The actual forms of the pieces are fairly close to the forms of several dismantled pre-1600 buckles and belt ends that I have seen, but the period belt ends and buckles were not soldered, they were simply riveted together. My husband’s belt uses slightly different construction techniques and suffers from slightly different flaws. The leather belt in this case is 1 inch wide – again an acceptable width. The basic form of the pieces is based on period buckles and belt ends. And then we have the mounts. Lovely cast pieces that are definitely a period form and look quite nice. 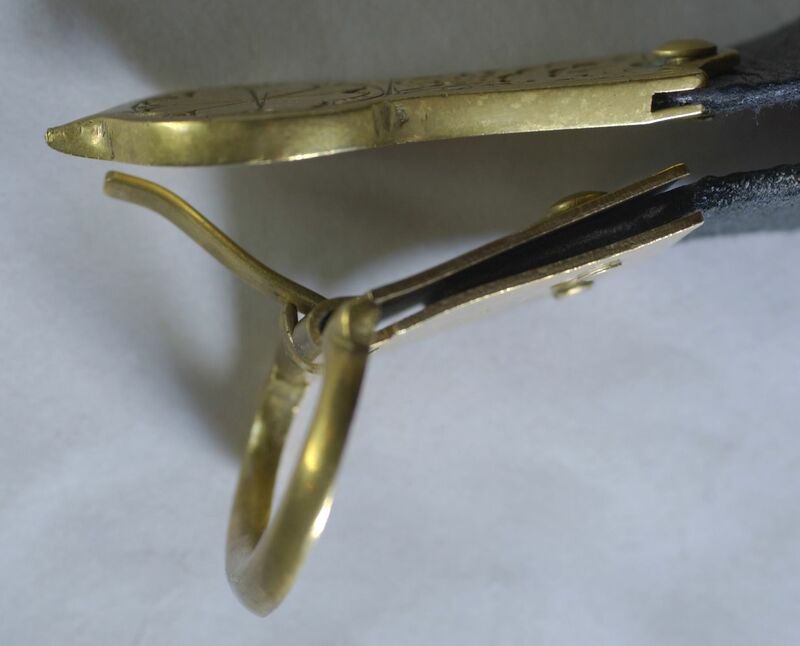 And a side view of the buckle and belt end to show the actual construction techniques. You can see that the plate that holds this buckle in place is actually just a folded piece of metal, and the rivets hold the metal tight to the belt. The belt end is a solid cast piece with just a small area where the end of the leather belt can be inserted. The belt end weighs a ton – about an ounce all by itself. By Medieval terms this is a TOTAL waste of metal. But how thick should the metal be? We will talk about that next time! 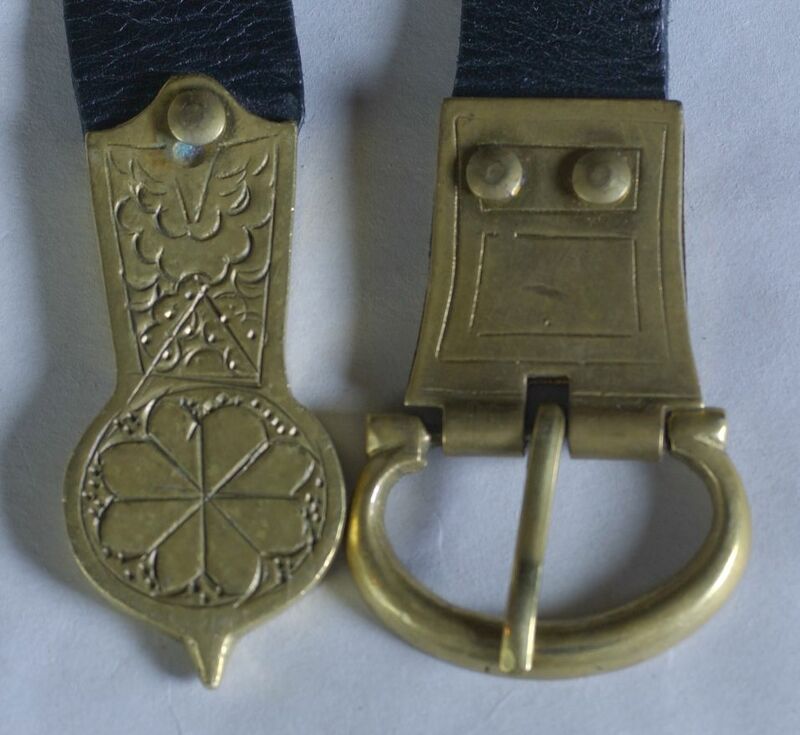 This entry was posted in Buckles, Dress Accessories, Jewelry, Metal Casting, Metal Working, SCA Life and tagged Belt (clothing), Belt buckle, belt end, Medieval belt buckle, Medieval belt end by Eirny. Bookmark the permalink.